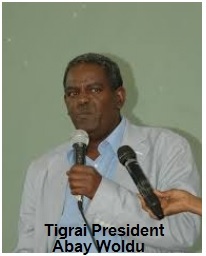 President Abay Woldu : Challenges of Tigrai Today! It has been few years since president Abay Woldu became the president of Ti grai. The president was chosen as we were told because of his unflinching desire not to be corrupt and his achievement during his prior assignment which was mainly dealing with the rural/agricultural development of the region. The President has set his government priorities for the coming year as you can see in this reportage. After you read it carefully and if you have been to Tigrai recently share your thoughts about the president’s priority. What is your impression overall where Tigrai is today in terms of development and carrying on with Meles Vision. Are you satisfied the achievements made so far is worthy of all the sacrifices our people made over the years? What is the most troubling development you observed and faced in Tigrai? And what do you think the regional government can do to improve things? Have Your say!